2019 is going to be a banner year for Comic-Con. Not only will the organization celebrate its 50th birthday in America’s Finest City, but it will venture off into a new frontier with the opening of the Comic-Con Museum in Balboa Park. The museum will document the long and storied history and relationship between Comic-Con and San Diego, and will celebrate all things comic book related, from its early beginnings to its current influence on all things entertainment media related. While the museum hasn’t provided an official date for their grand opening, there continues to be an anxious buzz emanating from the walls, reflecting the anticipation of amazing things to come. The museum has already started holding special events, prior to their official opening, giving attendees a small glimpse of the museum’s potential. Recently, Convention.Life was invited to participate in a very special event being held at the museum. Comic-Con held a one-day symposium for aspiring artists and writers, as well as professionals, interested in the art of storytelling. The event was called SAM: Storytelling Across Media, and Comic-Con didn’t hesitate at pulling out all stops, inviting some of the comic book industry’s biggest names to be special guests for the day. 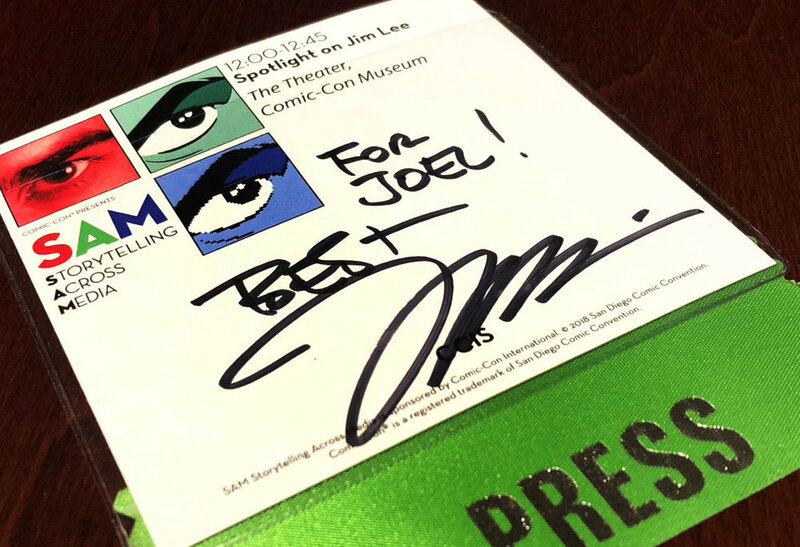 Guests included: DC Comics Co-Publisher and Chief Creative Officer (and comic book legend) Jim Lee, writers Julie Benson and Shawna Benson, and writer-of-all-things J. Michael Straczynski. The symposium’s panels focused on teaching methods for creative and successful storytelling across all media: Animation, Sound and Music, Film, Comic, Board Games and Video Games. Additionally, guests held panels in storytelling in Long Form / Short Form Writing and Augmented / Virtual Reality. Convention.Life sat in on the first panel of the day, which turned out to be a spotlight on DC Comics Co-Publisher and Chief Creative Officer (and, again, comic book legend) Jim Lee. It isn’t often that one gets the opportunity to sit in a room of 50 people, alongside one of the masters of the comic book genre, as he freely gives out his secrets for effective storytelling. There are three kinds of shots. There’s the wide Establishing Shot that’s good for establishing location, relationship between objects. Then there’s the Medium Shot which is good for conversations, interpersonal dialogue between characters or objects. Then the last shot is the Closeup. The Closeup is used mostly to convey emotion. Every artist will create a different series of shots, and that actually is part of style that you don’t see. So, there’s the style of how people draw faces or bodies, but you don’t see the storytelling. You feel it as you read the story. It’s all in the hands of the artist. Lee continued, focusing in more on the fine details of the storytelling, and creating a visual world that has roots in real life. Within a shot, there is foreground, middle ground and background. They all have varying degrees of detail. All these little details, to me, they do tell a story, and when I draw a panel, I do think about that. I think about the objects in the background. I think about their clothing. I think about the way they sit and stand. I think about their histories that brought them to that moment. No one may care about that, but I feel like it does add something that readers subconsciously pick up on, and understand who these characters are, without having a whole mini-series to explain who they are. “Panel 1, establishing shot, Gotham City.” That’s Brian Azzarello. Alan Moore would be “It is April 13, 1993. If you look in the almanac, it was a hazy day, full of humidity. 87 percent. Please note this with a dial in the foreground. Please use the Helvetica font on that device to indicate…” I mean, there were scripts where it was 3 pages of single-spaced information about one page. I think that, what happens when you work full script, is that it allows the beats on the page to better reflect the emotional content of it, because [as a writer] you might have something that you really want to convey in a story, and the artist either missed it or doesn’t put the attention needed. But there are times that I deviate from it. I think the whole point is like ‘What’s the information that has to be conveyed on this page, and what’s the best visual look for it?’ We always encourage artists to deviate as needed, if they think they can create something that looks visually more appealing. When talking about storytelling, what’s interesting today, I was thinking about all the other people that are going to talk about how they create for their mediums. Every medium has shortcomings and pros and cons. One of the things that people talk about in comics that’s missing is there’s no sound, but I disagree. When I read comic book, I don’t see the sound effect. I don’t read it. I just hear it. In closing, Lee reminds the aspiring writers and artists that practice always makes perfect. It’s always refinements of refinements. The symposium concluded with Lee raffling away every piece of artwork he did during the seminar. A signing followed in the museum lobby afterwards, with Lee signing everything put before him by his adoring fans. He was there for an hour, signing and talking with everyone, continuing to tell stories. 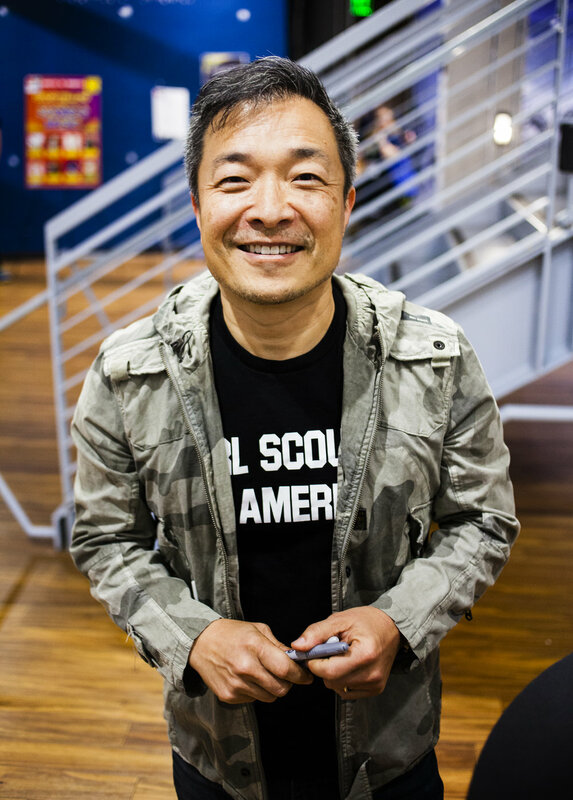 Jim Lee has been drawing comic books for the past 30 years. He is a founding creator of Image Comics and is currently DC Comics Co-Publisher and Chief Creative Officer.